By June the black fly and the mosquito have both begun to take over the Maine woods. In recent years, Down East has caught up with the southern part of the state and we are now seeing a slow but steady invasion by deer ticks. One bite from a tick carrying Lyme disease has the potential to completely destroy the health and well being of an individual and has even in some cases caused death. With one in four deer ticks carry Lyme disease, according to Jim Dill, pest management specialist with the University of Maine Cooperative Extension; it is imperative that Maine residents are properly prepared to address the tick issue. While bug sprays containing Diethyl-meta-toluamide (DEET) like the commercially Bens 100 and Deep Woods Off are extremely effective in keeping black flies and mosquitoes away, ticks require Permethrin. Sure, the warning label contains multiple references to developing cancer but at least you won’t die of a tick bite! Since I started using Permethrin, I can sit in the leaf litter and tall field grass all day without seeing a single tick. Just MAKE SURE to read the back of the can as Permethrin has to be applied in a very specific way and cannot be applied directly to bare skin. Yeah, I know, I know . . . but like I said before, at least you won’t die from a tick bite! Thus properly equipped to fend off Maine’s voracious blood sucking insects, why not take a short hike up Bell’s Mountain and Crane Mountain at Tide Mill Farms in Edmunds (Delorme’s The Maine Atlas and Gazetteer (MAG), Map 27, A-1). Both of the hikes are rated as moderate difficulty and for the effort invested in climbing the 1.2 and 1.4 mile trails are rich with rewarding views of Cobscook and Whiting Bay. Hikers should bring binoculars as the endangered Fin, Humpback, Minke, and Atlantic Right Whales frequent these waters and can sometimes be spotted from the summit. While the trails are managed by Inland Fisheries & Wildlife (IFW) both mountains are privately owned. It is certainly a privilege to have access to these mountains, so visitors should make sure to pack in and pack out any garbage. To access the Bell’s Mountain and Crane Mountain trailhead from southbound on Route 1, turn right onto Bell Mountain Road 0.3 miles after the green bridge crossing Crane Mill Brook and proceed 0.25 miles to Bell’s Mountain trailhead on left. To reach Crane Mountain trailhead, continue on Bell Mountain Road for 0.7 miles. Bear right at fork in the road and follow to the end of a short road for trailhead parking. If the gate providing access to Crane Mountain parking lot is closed, park at the Bell’s Mountain parking area and walk. Another fun mountain to explore is Klondike Mountain in Lubec (Map 27, A-4). This small monolith exists as part of the “Bold Coast”, a 40-mile length of coastline stretching from West Quoddy Head in Lubec to the town of Cutler. Dramatic rough hewn granite cliffs rise almost 150 feet above the water’s edge and blow holes, caves and arches all add to the absolute splendor of this exquisite area. Several varieties of highly specialized plants including many only found in alpine or sub-arctic habitats call this area home, so great care should be taken to stay on marked trails to avoid impacting this fragile ecosystem. The hike to the summit o Klondike Mountain is rated as easy/moderate difficulty and the summit can be reached in 0.6 miles. The trail skirts along the water before rising 150 feet through forested land to a bald summit overlooking South Bay, Cobscook Bay, Lubec, Eastport and Campobello Island. To access Klondike Mountain, travel 1 mile north of Route 189 on the North Lubec Road. Look for the Klondike Mountain sign on the left. The trail begins in open field sprinkled with apple trees. Tired of hiking and looking to pick up the rod and reel? Chalk Pond (Map 25, B-1) in Beddington is a shallow and weedy 32 acre body of water located near the intersection of Rt. 9 and 193. Access to the pond is possible via a short trail located at the pond’s extreme southwest end, off Rt. 193. As a warm water pond holding little dissolved oxygen and with a maximum depth of 19 feet, the pond is unable to support brook trout but does supports numerous pickerel in the 12-19 inch range and yellow perch, enough to provide fast action. 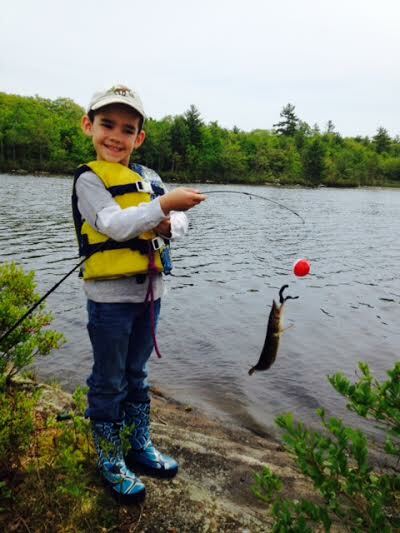 While it is highly unlikely that the next state-record pickerel will be pulled from these waters, Chalk Pond offers fast fishing that is certain to be enjoyed by all. Just don’t forget to tell any newbie anglers in your group that pickerel pack a mouthful of razor sharp teeth!! When fishing, be sure to concentrate efforts on the eastern side of the pond as the western side is extremely shallow. With a generous daily bag limit on pickerel set at 10 fish and with no length limit, even the hungriest anglers will catch their fill if they wish to keep a few. Decapitated, gutted, wrapped in tinfoil and thrown on the coals of a fire they are a campfire treat ready in minutes. Hi...just found your blog while looking for references to Vose Lake mrentioned in genealogy records of. my Vose and eventually Woodbury family. First references to Thomas Vose,having moved from Milton, MA to to Passamaquoddy in1790, which became incorporated into the town of Robbinston in 1811. This may be of no interest whatever to you, but I believe we are probably nuts from the same tree. Nice to know you are still there. My very first fishing experience (at 3 YO) was ice fishing on Vose Pond with my Dad. I lived my entire childhood a stones throw from Vose Pond until I moved to Central Maine in my early thirties. It is my understanding that the entire "Vose" family can be traced back to 3 brothers who came to America at some point in the 1700's. Guess if that is true, we are all distant cousins at some level! HA! Thanks for commenting!